I was born in the beautiful city of Cremona in 1532 to a noble family. I was the oldest of seven children: six daughters and one son. My father educated all of his children to be humanists. He encouraged us to study a variety of disciplines of which painting was one of them. At the age of 14 I studied art along with my sister Elena under the watchful eye of Bernardino Campi. During our stay we had daily sketching lessons and we learned about pigments and paints amongst other things. Campi later left for Milan and I went to study with Bernadino Gatti. My sister on the other hand decided to move on and enter a convent. Being a woman painter in the Renaissance period restricted what I was allowed to study and paint, so I concentrated on portraitures. I broke away from traditional portrait painting, in which a subject is formally dressed, and created my own style. I had the ability to capture expressions and show emotions, which was not done in portrait paintings. Of all the portraits I painted only 13 have survived. One of my best known portraits is The Chess Game. It shows my sisters Lucia, Minerva and Europa enjoying a game of chess. Another important portrait was actually a double portrait. I painted my mentor Campi painting a portrait of myself. When I was 22 years old I went to Rome for a short period to sketch. While I was there I had the distinct privilege of meeting Michelangelo and I even informally trained with him. Michelangelo would give me sketches that he created to copy so he could critique my work. I would even send him sketches of my own work seeking his advice. In 1559 I went to Spain at the request of King Philip II and I was appointed painter to his court. During my time there I became very close to his young wife and Queen of Spain. I even instructed her on how to paint. I stayed as the court painter for a little over a decade. At that time the King arranged for me to marry Don Fabrizio de Moncada a Sicilian nobleman. We eventually moved to Sicily, but my stay there did not last long due to the death of my husband. I decided to return to my birthplace in Cremona. On my journey I met Orazio Lomellino, captain of the ship I was traveling on. Not long afterwards we were married and we settled in the city of Genoa. I was extremely fortunate that both of my husbands supported my work as a painter. While in Genoa I continued painting for noble families. I even had my own studio and many artists came to visit and learn my style of painting. In 1623 I was visited by a young Flemish painter by the name of Sir Anthony Van Dyke. During his visit he drew my portrait and wrote notes of his visit in his Italian Sketchbook. Not long after his visit I died in the city of Palermo in 1625. I am considered the first successful female artist of the Renaissance and the first to attain international fame. Many feel I opened up the door for future women artists to learn and explore the art of painting. 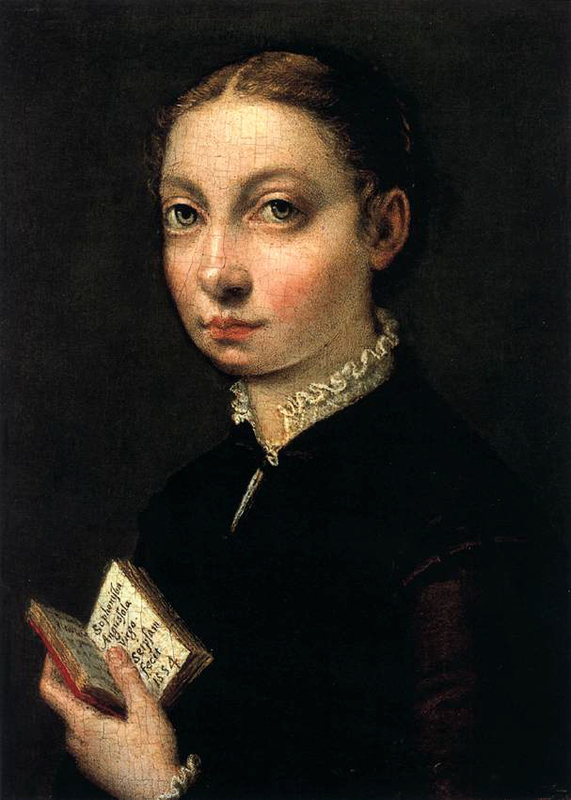 My name is Sofonisba Anguissola and below you can find more information about my life and my accomplishments. This is a very in depth look at the life of this famous painter. This article discusses each phase of her career and it inlcudes pictures of her paintings. Sofonisba painted this self portrait in 1554. This is a brief biography, which also includes images of her paintings.